Just now, the formal dresses 2015 for women collection by Zahra Ahmad have been released. There are summer dresses in this collection which are suited to be worn in wedding functions and parties. All these dresses are looking delightful. These dresses are ideal for modern and young girls. The prices of all these dresses are in the reach of most of the women. Their styles and colors are making these dresses very amazing. Zahra Ahmed is one of the most famous and leading fashion designers of Pakistan. Her superb collections are reasons for her popularity and fame. For every season, she launches occasional and seasonal dresses. Zahra Ahmed always gained a good response after launching its numerous collections. After launching several lawn collections, now Zahra Ahmed is back with another occasional collection. 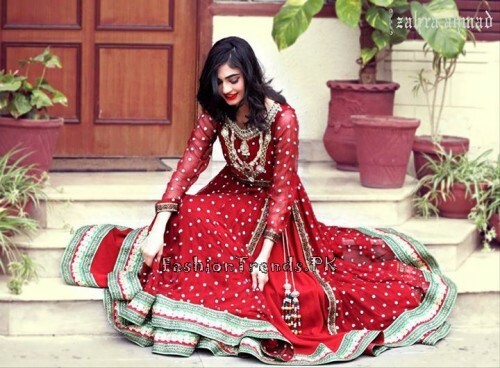 Now she has released the Zahra Ahmed formal dresses 2015 for women. This formal dresses collection includes such summer dresses which are ideal to be used in formal functions. It means these dresses should be used in wedding functions and parties. There are dresses of silk and chiffon in this collection and heavily embroidery is used to embellish these dresses. In this collection, you will find dresses like lehanga cholis, long maxis, A-line and tale frocks. The colors used in this collection are bold including green, red, peach, ferozi and others. There is adoration of dye look and tie in most of these dresses. The prices of all these dresses are very affordable while their look is stylish and simple. These dresses are absolutely perfect for those girls who want to look very beautiful in important occasions. 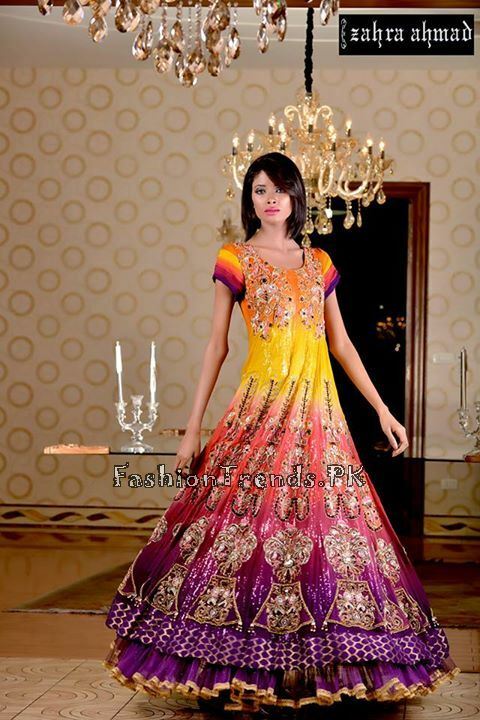 Few latest designs of Zahra Ahmed formal dresses are given here in different pictures.